These two volumes I edited in a fashion that tells Jane Goodall’s life story largely in her own words. 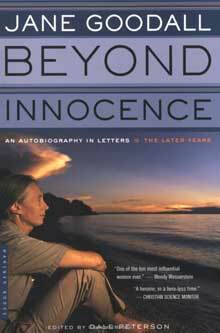 The idea of a letters collection came to me soon after I began, in early 1997, working on her biography. I was visiting her family home in England for the first time, doing some preliminary interviews, and getting to know the family. One morning after I sat down to breakfast in their kitchen, Jane’s mother, Vanne, appeared, clutching a ragged bundle of scrap paper. 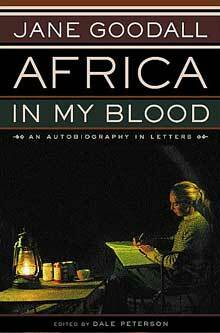 “Dale,” she said, “I thought perhaps you might be interested in this.” She laid the bundle in front of me, and, as I soon discovered, it contained letters from Jane written in Africa, mailed home, some of them penned in the field while she was waiting for the chimps to appear. As I quickly realized, they were just beautifully written—personal, witty, insightful, powerfully observed. A few days later and Vanne had discovered more letters; and over the next few years, more and more kept turning up. What a treasure! Other letters emerged from the National Geographic files, more from friends, several from business files maintained by Jane and her institute, and a few turned up at the bottom of a tin trunk in her cabin at Gombe Stream National Park in Tanzania. It’s always been my own quietly personal opinion that her letters are her very best writing, and I do strongly recommend the collection to anyone wishing for a quick and pleasurable insight into the woman and her life. The early years volume has been translated into Chinese.